A guide to triathlon by two Olympic heroes. 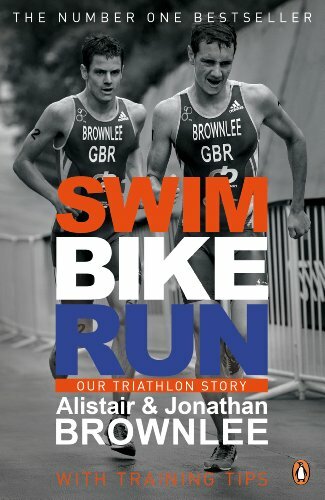 It tells the story of how two skinny lads from west Yorkshire became the best triathletes in the world. Swim, Bike, Run - The ultimate guide to triathlon by Olympics heroes Alistair and Jonathan Brownlee A Number One Bestseller This is the story of how two skinny lads from west Yorkshire became the best triathletes in the world. Meet the Brownlees: Olympic Champion Alistair, World Champion Jonny. Brothers, training partners, rivals. They have obliterated the competition and set new standards for swimming, biking and running. In this revealing, often very funny book they take us inside their world. It's both a riveting story of the races, the success and the brotherly rivalry, as well as a guide to triathlon with sections on how to swim, bike and run and packed with advice on nutrition, injury, and mental approach. This book will appeal to readers of cycling and running books like Mark Cavendish's Boy Racer and Running with the Kenyans, as well as fans of Chrissie Wellington's A Life Without Limits and Andy Beckett's Can't Swim, Can't Bike, Can't Run. 'Sport has two new heroes: a couple of nice lads from Yorkshire' The Times Alistair Brownlee, 24, is a British triathlete from Yorkshire. He is the reigning Olympic champion, a back-to-back European champion and a two-time World champion. Jonathan Brownlee, 22, is also a British triathlete from Yorkshire. He is the reigning World Champion, a two-time World Sprint champion and an Olympic bronze medalist.